D&O is not just for publicly-traded companies anymore. Privately-held companies and their directors and officers are at risk of claims from a multitude of sources, and many of those claims can be covered with a properly written D&O policy. 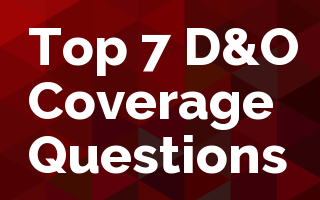 In this webinar, we will review some of the most common questions that arise regarding who needs D&O coverage and how to place a policy that will provide value to the insured. Topics to be addressed include the D&O exposures covered by a policy, the meaning of the warranty on an application, the difference between a retro date and a prior and pending litigation date, and the dangers of certain prevalent exclusions. Gain a solid understanding of the need for D&O coverage and will be able to identify common pitfalls in coverage offerings.